Click to see photos from the 2014-2015 school year! Click to see photos from the 2013-2014 school year! I'm guessing many of you in blogland are much like me when it comes to setting up a new room. I am way too detail-oriented and the process takes FOREVER! Not that I'm complaining...I really do love setting up a new room. I moved into a gigantic (to me) classroom, but since I will only spend half a day there, I will share with another teacher who teaches the same group of students. Normally this wouldn't pose much of an issue, but her curriculum is in a different language than mine, so I really only have half a classroom. 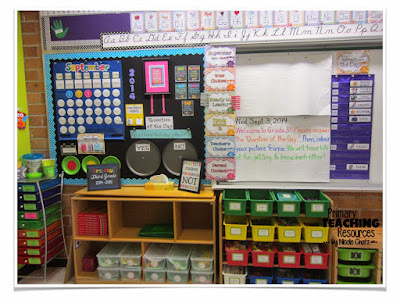 We began by choosing bulletin boards and agreeing to the same bulletin board trimmer. I then spent 8 hours (yes, you read that right!) putting up fabric and borders. All those darn staples had to be removed first! Thankfully, I managed to get all of this done before I left for summer break. Anyhow, enough rambling. Here are some pics of what I have been up to. Entrance to the classroom. Still waiting for my whiteboard to be installed. Monkey Student of the Week on top, listening station down below. My still messy desk area. You can see one of my monkey curtains in the background. Reading / Meeting Area - this part is mostly done. I know this is from last year but I am a fellow "monkey-themed classroom" teacher! I love, love, love your information hut at the entrance of your room!!! And I too have a "Top Banana" instead of "Star of the Week"!! I teach first grade and all of the students, even ones I don't have, love all of the monkeys! I think it's one of those things that makes being at school fun for them. I've gotten so many monkey-related gifts from students also, so it just keeps adding up! Also, I love the idea of using fabric instead of bulletin board paper. Thanks Kristen. I was disappointed to have to take it down in June, but I will be on mat leave for the coming school year. Good luck to you in September! I also use a monkey theme in my classroom and I teach 4th grade. I love your cool ideas! Great job!!! love the umbrella in your Adorable room!!! how did you secure it? I have a question about your bananas about books board. Could you tell me about the stuffed animals/beanie babies? Darling! Love the monkey theme! Your sayings are so fun! Thanks for sharing! The beanie babies represent reading strategies. I got the idea from Christina Bainbridge's website a few years ago. If you google "Beanie Baby reading strategies," you should be able to find out more info. Ashlee, I tied the umbrella to my chart stand, but actually ended up removing it altogether partway through the school year because it felt like it was blocking too much light. Does it matter what type of fabric to choose for the bulletin broads....such a great idea! I'm not sure what the type of fabric is called, but it's the kind without a lot of stretch. Broadcloth, maybe? Where did you buy your carpet? Creative Children (online catalogue), I believe. I found it to be a waste of space, too. We used the buckets for class books (in duotangs) and sometimes chart markers. 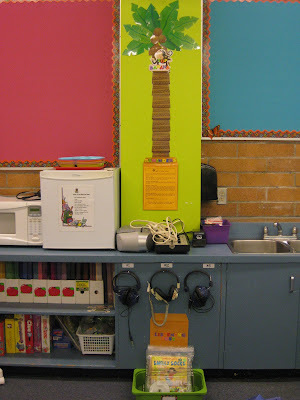 The chart stand belonged to the teacher I shared a room with, so I won't have one next year. I'll just put my chart pad onto the white board instead. 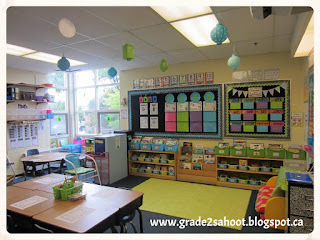 I just found your blog through gradeOnederful. It is awesome! I teach Grade 2 in Langley. :) Whimsey Workshop and I are planning a BC Blogger meet up in August... I will post details on my blog, and on TPT forum as soon as I confirm a few things. Here is a tip: I use sheets and tablecloths that I find on sale, at second hand stores or yard sales for my large bulletin boards. No piecing fabric or spending a lot on yard goods. I DO buy fabric for curtains for my windows, and use tension rods to hang them. Great site you have here! I also use fabric! It's called broadcloth and it costs $2.50 per yard, at the fabric store, which ends up working out to about $50 to outfit a room with lots of boards. The investment is worthwhile though, as I typically get 2-3 years out of it (so long as I don't move rooms or get bored of the colours)!